Powered by AutoStore, KYOcapture is a full-service document capture software for companies that want to better manage their paper and electronic documents while improving productivity, security and compliance. KYOcapture is ideal for the distributed capture environment, improving workplace productivities while minimizing processing time, courier costs and storage space. Capture both paper and electronic documents from virtually any source - from a desktop PC to a network scanner, MFP or copier. Process your captured documents with ease while De-speckling, De-skewing, and reading barcodes. Then convert your documents into a variety of formats, such as text searchable PDFs or MS Office Documents. These simple to configure image enhancing features improve the quality of the document. Route documents to virtually any destination: fax, email, network folders, PCs, as well as leading document management systems (DMS). 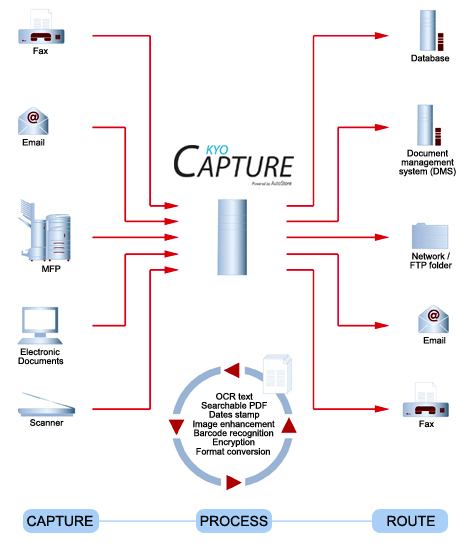 KYOcapture Express is a simplified document capture workflow solution designed for small to medium sized business which integrates with select Kyocera MFPs allowing users to capture documents, index & OCR for full text search capabilities directly from the MFP. KYOcapture is a comprehensive document capture workflow solution designed to satisfy more complex document capture needs. It integrates with select Kyocera MFPs allowing users to capture documents, index, directly from the MFP. A variety of processing and routing options are available, connecting major document management systems such as IBM Content Manager and Interwoven NT/MP.